Generations of kids who grew up in the 50s, 60s and 70s looked forward to the holiday gift season and the possiblity of unwrapping a bounty of toy soldiers and playsets. In the post-WWII years, companies like Marx, Airfix, Britains and others churned out millions of plastic soldiers and accessories which would plant the seed for many a future wargamer. These boxes of relatively-inexpensive colorful plastic knights, cowboys and Indians, soldiers, horses, forts, castles, log cabins, wagons and tanks fuelled imaginative play and a collector’s spirit for kids before video games eclipsed playtime beginning in the 1980s. For you Generation X kids who now have children of your own, toy soldiers are a still a fantastic way to add a little something different into the holdiay season. There’s a truly wonderful company called The Toy Soldier Company with a singular mission of keeping the toy soldier tradition alive, both for us nostalgia-prone grown-ups and for kids just waiting to discover the imaginative creativity and variety that play with little plastic figures brings. The Toy Soldier Company offers a dizzying selection of plastic and metal figures, playsets and accessories in all scales and price ranges. No matter your era of choice — Ancient Europe, Colonial America, Civil War, The Old West, The World Wars, Modern or Sci-Fi — the inventory is enormous and ever-growing. 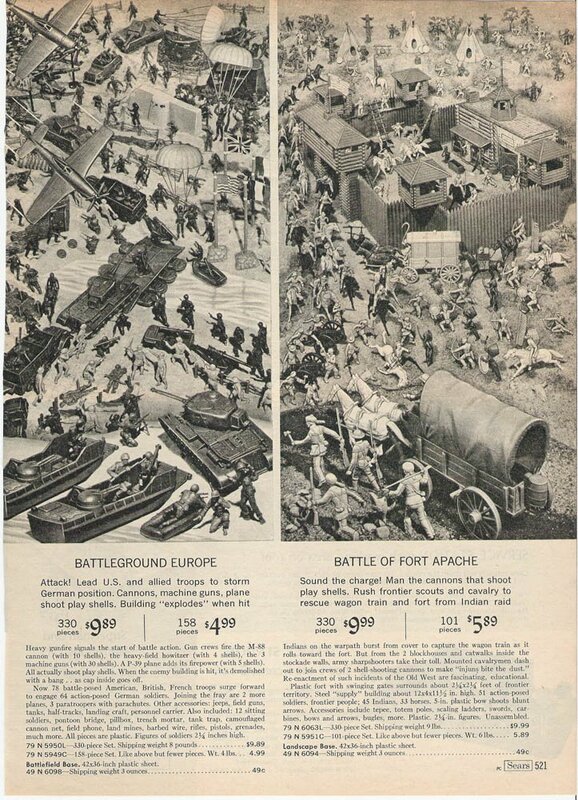 One of their most unique offerings is their playsets which seek to recapture the glory days of the 50s-70s when catalogs like the annual Sears Wish Book Christmas catalog offered pages filled with often fantastic depictions of playsets, primarily from Marx (like those shown in a Sears catalog from 1966 at the right). As a kid, you couldn’t help but marvel at the possibilities the often-exaggerated drawings and photos of these playsets. The imagination of young generals reeled from staring at the pages in the catalog and thoughts of future battles to be waged on the living room rug or in the sandbox out back. Lots of kids would eventually take their plastic play and creativity further by spending hours hunched over workbenches with tiny brushes and their first efforts at miniatures painting. For those of you with children in your life, toy soldiers are still certain to be a hit for the holidays. You can even bridge the eras by getting a kid the latest from the Call of Duty video game franchise, a box of soldiers and maybe some paints. Another idea would be to buy some knights and Robin Hood toys along with a DVD of the classic The Adventures of Robin Hood starring Errol Flynn. A book about the American Civil War and some plastic soldiers in blue and grey would make another great package. 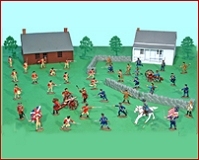 With toy soldiers then and now, the possibilities are only bound by the imagination for play.